RVs heat up like ovens when the temperature rises. 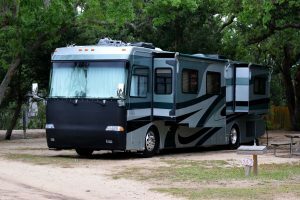 Of course, using air conditioning is the best way to keep your RV nice and cool for you and your pets, and starting it early in the day is key. However, we don’t always stay where we can plug into shore power and sometimes when it gets really hot, our RV’s air conditioner has a difficult time keeping up. 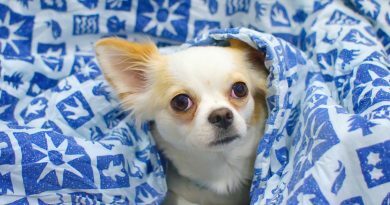 It is during this time that we try to take all measures possible to keep it cool inside for our pets. Here are some ideas to keep them comfortable. One easy way to cut down on the direct sunlight coming into our rig is having a reflective material attached to the inside of our windows. A product many RVers use is Reflectix. It’s like foil bubble wrap that insulates your windows while reflecting the heat away from the inside of your RV. Simply cut it to fit your windows, including the window in your RV door, and attach it using hook-and-loop or double-sided acrylic tape. When we use Reflectix, the temperature noticeably drops in our RV. While we haven’t actually measured the difference, some RVers have and claim a ten degree decrease in temperature when they use Reflectix. NOTE: Reflectix is not recommended for use on double-paned RV windows. Keeping windows covered helps keep your RV cool. In addition to using Reflectix, we have room-darkening cellular blinds that keep out the heat. 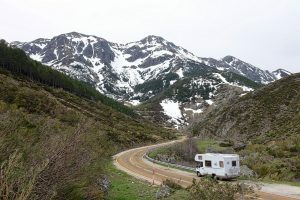 Other RVers have shared that they have room-darkening roller shades or thermal insulating curtains that help reduce the heat that comes into their RV. Our blinds are light colored and still add light, but block out the heat of the sun. In the summer though, the RV stays dark with the Reflectix behind the blinds. This has worked so far for us, but the blinds are beginning to fall apart. Instead of purchasing new blinds, we think that we’ll try thermal insulating curtains. By using the curtains plus the Reflectix, the RV should stay pretty cool inside. We often use our awning when it’s not windy, to shade one side of our RV. This has helped keep our rig cooler and gives us a place to sit outside with our pets in the shade. Unfortunately Mother Nature cannot always be counted on to keep the breeze down, and we have had to pull in our awning more often than we care to count. So, we just rely on other ways to keep the RV cool for our pets and putting out the awning becomes a bonus. 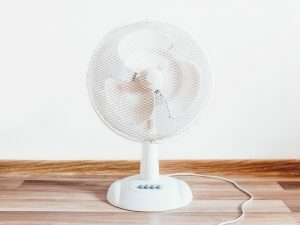 Point a fan at your pets to keep them cool. We have a few small electric portable fans, a 12 volt fan, plus a ceiling fan that we use to keep the air moving in our RV. Our senior dog loved to have one pointed right at him while he was resting so we dubbed that “Bear’s fan.” The nice thing about keeping the air moving is that it helps the cool air from the air conditioner travel from one part of the RV to another. This is especially good in our RV since we only have one air conditioning unit. Our RV stays nice and cool in all areas when we use the fans. I really like to have my vents open to circulate air. However, when the summer sun is beating down on the top of the RV, it’s time to close them and plug them up with insulating vent pillows. As you know, vent covers are not well sealed and they let in quite a bit of heat just like RV windows and skylights. These “pillows” help keep the heat from coming in through the RV vents but are easy to remove when a vent needs to be used. If you have white vent covers like we do, I recommend the kind that have a reflective surface on one side so that the sunlight is reflected away from the inside of your RV. Many RVers use cooling pads, vests, and/or collars for their dogs when it gets hot. We have a Drykewl evaporative cooling pad and it works really well for about five hours before it needs to be reactivated. There are other cooling mats on the market, you just need to decide which type you are comfortable using in your RV: one you get wet and wring out like DryKewl, one you can put in your refrigerator, or one where the cooling gel is pressure activated by your pet lying down on it. Cooling vests and collars are simply worn by the pet and come in a variety of styles and types. Most use evaporative technology. No matter which you choose, your dog or cat will appreciate having something nice and cool to call their own. 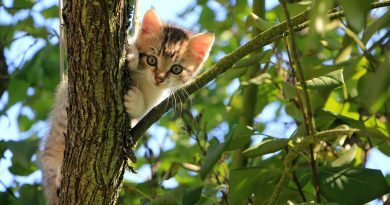 Keep your pets cool by moving to higher elevations when it gets hot. No system is fool-proof when it comes to keeping your pets cool in an RV, even if you have a temperature monitoring system. Always be aware of how your pet is dealing with the heat and if it’s too hot, certainly don’t leave your pets alone in the RV. Usually, if it’s too hot for you, it’s definitely too hot for them and it’s time to find a cooler location. 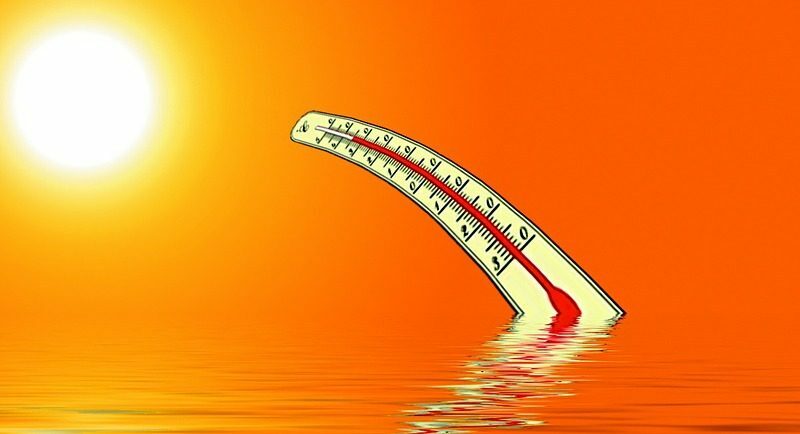 *If you want to know more about temperature monitoring systems, click on the link below for an in-depth article telling about the different kinds. How do YOU keep your RV cool enough for your pets? We did not receive any payment to review any of the products mentioned, which allows us to provide an unbiased opinion. One or more product samples mentioned in this article was provided by the manufacturer for review. If we find a good product at a good price online, we will sometimes provide an affiliate link to help you find that product. Using this link will not cost you anything additional, but does allow us to receive a small commission on a sale from the online retailer to help support the creation of our website. Without you, there is no Tire & Tails website, so we really appreciate your support.